ShipbuildingTribune.com (as well as other sources) are reporting the acceptance of the third of nine planned “Hero Class” cutters, CCGS Corporal Teather C.V, by the Canadian Coast Guard. If you see a family resemblance to the Webber Class Fast Response Cutters, it is not your imagination. These are based on the Damen 4207 patrol boat design (42 meters long, 7 meter beam) while the FRCs are based on the closely related Damen 4708 (47 meters long, 8 meter beam). Boats from this family of designs are used by 13 countries. It appears the USCG will have the largest fleet with 58 of the vessels currently planned, but in addition to Canada’s nine, Mexico already has at least two and reportedly may build up to 28. Only South Africa and the US use the larger 47 meter version. The contract for the nine vessels reportedly was for $194M (presumably Canadian $). With first steel cut in 2010 and the last of the nine scheduled for delivery in 2013, they seem to be moving the project along smartly. The Canadian Coast Guard is not a military service and their vessels are not armed. But there has been talk about arming these and other Canadian Coast Guard vessels. Like the USCG vessels. these little ships are named after heroes. 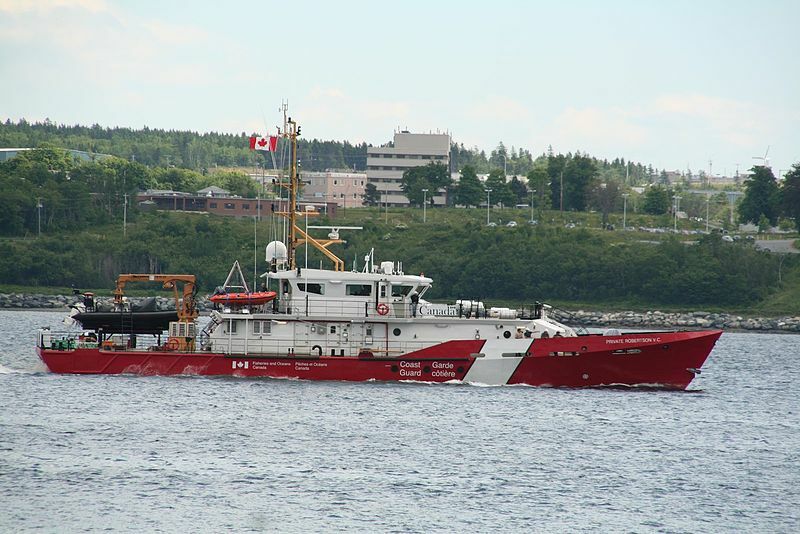 Unlike the American vessels, the heroes include representatives from other services, including a fisheries officer, Mounties, and the Canadian Army in addition to the Canadian Coast Guard. One thing I found interesting is that while the Webber class have a nominal endurance of five days, the Canadian vessels are claimed to have an endurance of two weeks. I’ve always suspected the Webbers were capable of more. I wonder when Coast Guard will be displayed on the hull sides in Spanish too. We do have to keep up the the Canadians. Please Bill, don’t give the PC police any unwelcome ideas. Lee, thought you might pick up on that. I guess might be a work boat aft? How many USCG cutters can launch & recover two boats simultaneously? All the WMECs and larger can normally launch two boats, but it would be very rare for a patrol boat. The Australian patrol boats of course do have two identical RHIBs on davits. She looks nice. I wonder if the CGC has any self defense protection. So if you were to put a side by side comparison. How dose the USCG’s Webber compare to the Canadians. As stated the CCG boats are not armed although if they have Mounties on board, they may be armed. Nicky, I think you have all the information you need to do the comparison. The FRCs are the fastest. The FRC’s nominal max speed is 28, but I recently saw a statement that they could do 32 knots. That would be a pleasant surprise. All the others top out at 26 or less. The FRCs also have the highest displacement. In the case of the Amidale the difference could just be their aluminum construction, but considering thatt they are already showing signs of deterioration with use it may also be less robust construction. The Canadian vessels and the other 4207 based boats are simply smaller, about 2/3 the size. It does seem the FRCs cost much more, but at least part of that is that is that they are very well equipped and the Coast Guard costs account for all the costs of bringing the ships into service including training, personnel, and infrastructure costs. So would you say the FRC is well equipped and well armed vs the Armidale and the CGC Hero class cutters. How would riding on the FRC be compared to the Armidale and the Hero class cutters. I haven’t ridden any of them. I can only say bigger ships usually ride better. Weapons on the Amidale are essentially identical. I’m a bit confused, because I thought they had all been delivered a while ago.